Would you like to love much like the woman of whom Jesus spoke in the above passage? I hope your answer is a resounding, “Yes!” Whether it is love for God or love for others, we should all want to grow in our capacity to love. If you are making it a habit to begin each day praying the ilive2love seed prayer, 1(which I hope you are) then your passion to live to love with Jesus should be growing. I want to fan the flame of that passion in this month’s Chariot of Fire. I enjoy putting myself into the sandals of people when I read the Scriptures, so please bear with me in a little speculation as I recount this story from Luke 7. I’ll stay true to the central points of the story, but I also invite you into the scene as Luke tells it and I imagine it. Jesus is dining at the home of a man who didn’t consider himself much of a sinner. He’s a Pharisee, a very religious man, and therefore is naturally attentive to his reputation and adherence to the expected rules of piety among committed Jews. As might be expected, the other guests are some of his friends and fellow Pharisees, with one exception. By God’s providence, a woman with an immoral reputation gains access to this engagement. She has heard where Jesus is going to be, and apparently considers it her opportunity to express her love to Him. She waits around the door for His arrival. As Jesus arrives, I picture her blending into the crowd of His followers as best she can because she knows she isn’t on the invitation list. She draws closer to Him and waits for Him to find a place at the table. As soon as He reclines at the table upon His elbows with His feet extended away from the table, she stands behind Him. When her first tear drips upon Jesus’ foot, He turns His attention to her. The casual conversations around the table slowly cease as the holy moment takes center stage. The sound of her crying pierces the silence as the woman’s tears erupt into rivulets flowing down her cheeks, onto His feet, and stream between His toes, carrying the dust of the street onto the rug. Enough tears collect on His feet that she leans over them, allowing her hair to swing over her shoulder to blanket them. Tears of gratitude continue to flow, and the woman tenderly wipes away the dirt with her hair until His feet appear clean. Everyone is in shock. Minds race—questioning, analyzing, judging, and wondering what to say or do. But the outpouring of love from this woman toward Jesus has just begun. She repeatedly kisses His feet with a stunning freedom—no inhibitions—that incenses almost everyone. Slipping a vial of perfume off her shoulder, she opens it and pours a generous stream upon His feet and she massages the weariness out of the muscles and tendons of His feet that had traversed the Judean roads all day. The pungent smell of the perfume wafts through the room on a cool breeze, accentuating her extravagant expression of love to the Lord. With their eyes riveted on Jesus, everyone in the room expects Him to reprove this unwelcome, unexpected, uninvited intruder. Instead, knowing the judgmental thoughts of their host, Jesus addresses Simon. Everyone around the table seems to have missed one of the important lessons to be learned from this woman’s outpouring of love upon Jesus. They were too puzzled and troubled by the reputation of the woman and Jesus’ authority to forgive sins. I wonder if anyone got Jesus’ point and lined up behind the woman at His feet, anxiously waiting for their turn to confess their sins and express their love to Him. Let’s not miss this: If you know in your heart that you have been forgiven much sin, loving Jesus and others (in spite of their sins) comes naturally—it flows like the tears of this woman, deeply touched by His love. According to Jesus, she had obviously been forgiven of much sin, and she knew it, evidenced by her outpouring of love and service. Aware that she deserved condemnation and damnation for her many sins, she instead had received mercy and forgiveness through faith in Jesus Christ. She believed He was Immanuel, God with us, the One sent from God to take away our sins. Jesus’ message to Simon and us is this: Those who are forgiven much, love much. Those who confess many sins, receive much forgiveness. I grew up thinking that I needed to confess sin as soon as I recognized it and then keep “‘fessed up” if I wanted to be right with God. Although there is some truth to that notion, in time I came to understand more of the gospel and saw the sweeping, sin-conquering, death-defeating work of Christ on the cross. I began to comprehend that God had saved me before He laid the foundations of the world; He had saved me when Jesus died on the cross for my sins; he saved me when I first placed my trust in His Son’s work on the cross on my behalf; He saves me every day; and He will save me when I stand before Him in the Judgment. I realized that I had been made right with God forever and that I had been forgiven of all my sins—both the ones I recognize and the ones I will forever be unaware of. Just as I became a sinner at one time when Adam sinned, by the same reckoning, all my sins were forgiven by one sacrificial act of Jesus on my behalf. 3 In this event related in Luke chapter 7, this woman had been forgiven for all her sins. In just the same way, we have been forgiven for all of ours! This is an astounding truth! Having been known in Christ before the foundation of the world, all her (and our) sins were forgiven by God in Christ from all eternity. 4 We don’t confess our sins so that we might be forgiven; we confess our sins with confidence that God’s disposition toward us is to forgive and cleanse us, 5 which is proven by the faith He’s given us in Jesus Christ as our Savior. 6 The confession of sin opens the door to our experiencing God’s forgiveness, like the woman who washed, kissed, and anointed Jesus’ feet. At some point, that woman became deeply and painfully aware of her many sins and then experienced His forgiveness and love. Like so many others whom Jesus healed, touched, and forgave, she looked for an opportunity to return His love. The dinner at Simon’s house was the chance she was looking for. If those who are forgiven much love much, then it makes sense that the more we confess our sins before God with the confidence that we have been forgiven through Jesus’ death on the cross, the more aware we will be of the great forgiveness we have received. Norman Grubb, in Continuous Revival: The Secret of Victorious Living, wrote, “For where sin is seen to be sin and confessed as such, the blood is also seen to be the blood, praise God, ever cleaning from all unrighteousness; and where the blood cleanses, the Spirit always witnesses—and the cups run over again. But the blood never cleanses excuses—sin called by some more polite name.” 7 What does the cup running over look like? It looks like love. 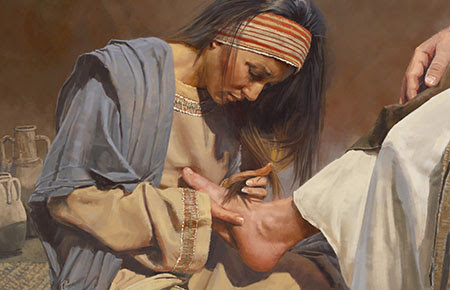 It looks like what the woman did at the feet of Jesus. He who confesses much, has been forgiven much, and loves much. This truth needs to move from our heads to our hearts and into our experience. Confessing many sins in the presence of God after voicing the ilive2love prayer ushers you into a space where you become more aware of your sin, the power of the cross, the incredible scope of His forgiveness, and the unending debt of love you owe to Him and every person God puts in your path. When I say “confessing many sins,” I’m not referring only to sins you’ve committed in the past 24 hours, but the sins of your entire life. Looking daily at my old natural, sin-bound self, my current weaknesses, and the constant redemption, transformation, and empowerment that are God’s great gifts to me brings me to the deep gratefulness and joy that I need to be the lover of Jesus and others that I long and love to be. I’m sure I’m not the only one who can admit to having been or being a proud, self-righteous, lustful, deceitful, lying, impatient, self-absorbed, self-ambitious, hypocritical, judgmental, complaining, envious, vain, messed-up sinner (just to name a few of my many sins). As I confess those sins before my God each morning and then look at His bearing my sins, separation from His Father, and endurance of shame, stripes, and the cross unto death, I am aware that I am entitled to nothing, but am a recipient of an unfailing, all-encompassing, hope-filled, fear-conquering love that I am compelled to return and pass on to others for His glory. I have been forgiven much, and the more I see it, the more I long to express it to Him and others. I know I’ve got a long way to grow, but I’m encouraged by the fact that the older I get, the more aware I am of the weakness and sinfulness of the flesh attached to this body of sin. That awareness provides more fodder for those times of confession, which adds to my experience of His forgiveness, which fans the flame of my love for Him and others. Have you found that you need His forgiveness and righteousness as much today as you did the first day you trusted in Christ? If you haven’t trusted in Christ for the forgiveness of all your sins, why not begin now? Take courage, friends. Humble yourselves, seek His face, and confess your sinfulness before Him, that you might experience His forgiveness and that His love may flow through your lives to God and to the people God puts in your paths. “For if by the transgression of the one, death reigned through the one, much more those who receive the abundance of grace and of the gift of righteousness will reign in life through the One, Jesus Christ” (Rom. 5:17). “Who has saved us and called us with a holy calling, not according to our works, but according to His own purpose and grace which was granted us in Christ Jesus from all eternity” (2 Tim. 1:9). “For by grace you have been saved through faith; and that not of yourselves, it is the gift of God; not as a result of works, so that no one may boast” (Eph. 2:8-9). Norman Grubb, Continuous Revival, CLC Publications, Ft. Washington, PA, pp. 27-28.